I posted this a few weeks ago and then the offer ended, but got voted to 318 within a few hours. 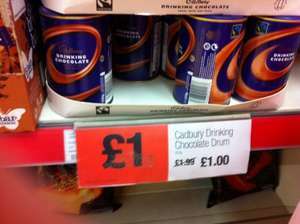 Its now back on £1 for 250g of Cadbury drinking chocolate. It costs £1.89 at Asda, so definately a good offer. There are plenty of Co-ops about - easy to get to. Home Bargains.. find one in the south west of england.. HOT !!! And it might be me, but don't even think about the 'own' brands - Tescos tastes nothing like Cadburys. Cold no offer.I never pay more than £1 for this product.I would like to see any good offer at the co-op because its become one of the most expensive stores throughout the land. Surely that's the half-sized version? Look, its £1 in a convenience store which most people can get to between 6am and 10pm. Don't knock the co-op either, they are the biggest retailer of own brand fair trade products. They also have a deal of 240 99 Teabags for £3.